These are the show notes to an audio episode. You can listen to the show audio by clicking here: http://traffic.libsyn.com/airspeed/AirspeedScorpion.mp3. Better yet, subscribe to Airspeed through iTunes or your other favorite podcatcher. It’s all free! 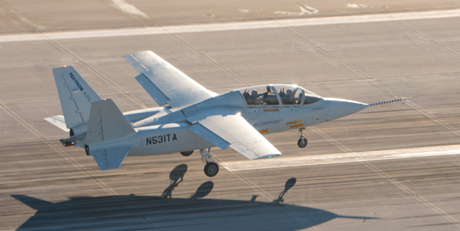 Last week, Textron AirLand flew its prototype Scorpion Jet for the first time. The first flight lasted 1.4 hours and concentrated mostly on slow-speed handling. We took advantage of the occasion to talk to Bill Anderson (president of Textron AirLand and SVP of Cessna Military Business Development) and Dale Tutt (the Scorpion program chief engineer). This episode contains the full interview covering everything from the aircraft generally to the development process to the first flight. And we talked about the plans to market and build the production version. Apart from the interview, my impressions are as follows. Somewhere among the capabilities of aircraft like the the MQ-1 Predator and MQ-9 Reaper UAVs, the A-10 Thunderbold II (Warthog) attack aircraft, and the F-16 Fighting Falcon and F/A-18 Hornet series multi-role fighters, there’s a gap that Textron AirLand wants to fill. A manned cockpit to provide local eyes (both human and electronic) on targets. The ability to fly both low and in the flight levels. Slow-speed performance to support imaging missions and small-aircraft intercept. Fuel efficiency to allow longer flights out and back with mission-enabling loiter time over the target. And plug-and-play capability that allows rapid configuration for different mission types. If the Scorpion Jet turns out to be everything it was designed to be, it will fill all of those gaps and more. The company says that the hourly cost to operate is likely to be around $3,000. Comparable with a C-130 or a helicopter if you buy NORAD’s numbers. There’s really nothing cheaper unless you count a CAP aircraft (about $130 per flying hour and great for what CAP does, but not very useful for putting warheads on foreheads or launching or operating the heavier sensor packages). This is a US-based project. The design and build came together here in the states, mostly in Wichita. It remains to be seen if the production copies are built here in the states. It would be nice to see an all-American aircraft in this role. Being fond of the T-6A/B and having time in the T-6A, it hurt a little when Hawker Beechcraft was shut out of the USAF Light Air Support (LAS) process in favor of the Embraer A-29 Super Tucano, even though the Super T will be built in Jacksonville. Lastly, this aircraft appeals to me because I’m a pilot. I know that it takes certain skill to fly a UAV. And I know that there are missions that don’t make sense for manned aircraft. But, at the end of the day, no automated system will ever equal a pilot’s eyeballs, hands, feet, and heart in the cockpit over the battlefield. When it really matters, you want a pilot in the ship and the Scorpion Jet is one of an increasingly scarce number of platforms that leverage our favorite stick-throttle interconnect: The pilot. Textron AirLand is continuing flight test operations and is actively courting customers. We’ll stay close to the story and bring you updates as they occur. In the meantime, there’s more information about the Scorpion Jet at www.scorpionjet.com.